Our September release included yet another fun way to create cards and projects with movement. Let's take a look at how the Circle Spinner Channels Die-namics work! Today's video will give you a step-by-step tutorial for using the Circle Spinner Channels in your designs. Follow along as Stephanie creates a project inspired by design team member Torico, using this product with the brand new Happy Hedgehogs stamp set. Watch the video below or click here (MFT September Release Class - Hedgehog Spinner) to watch it on YouTube. Don't forget to subscribe to our YouTube channel so that you don't miss a single tutorial! Let's take a look at few more examples of what you can do with the Circle Spinner Channels Die-namics! Torico features a cute sheep from the Ewe Are the Best stamp set jumping for joy thanks to the Circle Spinner Channels Die-namics. 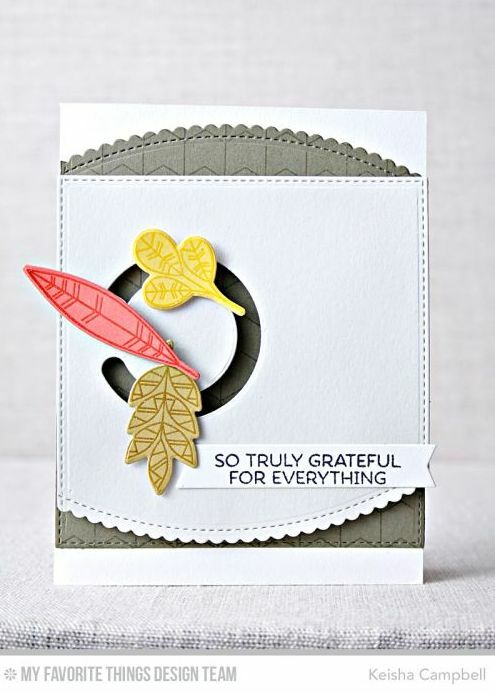 Keisha shows an elegant way to use the Circle Spinner Channels Die-namics with the Geometric Greenery stamp set. Karolyn's use of the Circle Spinner Channels Die-namics has the Radiant Sun popping out from behind the rainbow. So happy! I definitely want those dies!! !